I like going to renaissance faires. It's a point of pride, happiness, something to me that I've attended at least one faire at least once a year for 15 years. Even when I attend the same ones year after year, it never gets old. I look forward to eating my favorite meat pies, to shopping with the same vendors to see what new offerings they have, and to seeing my favorite acts. Sometimes the performances have the same script, but the audience is always different and that variable makes it fun. Since I've lived in Los Angeles, the Southern California Renaissance Pleasure Faire has become my go-to faire. I didn't realize until after I'd attended for a couple of years that this faire is the first modern faire of its kind. I know! It's been operating since 1962. It takes place in the spring and like most faires, it always seems to be ridiculously hot. The grounds are pretty big, and it's easy to spend a day there because there are so many shops and performances. I enjoy going, but I don't love it in the same way that I did with the renfaire in Ohio. I think that one has a special place simply because it was the first one I attended. Who knows. Anyways, when a friend of mine offered to take me to a different renfaire this spring, I jumped at the chance. It turns out the Koroneburg Old World Festival was just an hour and a half or so drive away and had plenty of fun stuff to do. I had just gone to the SoCal faire two weeks prior, but can you really ever attend too many renfaires in one month? I don't think so. It was a blissfully cool day and that automatically and maybe unfairly gave Koroneburg points. This may sound silly, but it is so nice to attend a faire and not spend the whole day sweating and feeling uncomfortable. The festival didn't seem to be terribly busy either, and it made for nice and lazy meandering. Since I spent most of the day running through comparisons to the SoCal faire in the back of my head, I thought I'd share them with you guys in case you plan to attend either faire next year. Free general parking (you can pay for closer parking, but it's not a far walk to the free stuff). Their coffee stand was set up like a little coffee shop by the jousting arena. It looked cute and comfy, and the iced mocha I got there was tasty. Less commercial atmosphere, felt more relaxed. You could get up close and personal to the joust. Great location with plenty of shade. Thomas Wood, the Pyro-Juggler, was hilarious. They had a fencing lesson place, and though I didn't participate, I observed and they spent a lot of time with anyone who stepped in (that may be different when the faire is busier). Rat petting. I know how that sounds, but I got to pet a rat and feed him Cheerios (rat donuts!) and it was fun. Admission is something like $8 or more cheaper than the Pleasure Faire. More attendees in costume than at the other faire. It was a bit on the small side. I think it would be hard to spend a full day there. The food I tried - a pita - was just mediocre. The shops were fun and offered great merchandise, but there wasn't a huge variety. They offer several options for food, and I've never eaten anything that wasn't delicious. It was weird to see food trucks there this year, but eh. Again, also a lot of choices for shopping. They have multiple vendors selling mugs, clothes, jewelry, weaponry, leather goods, shoes, and on and on. The location is bigger with lots of open spaces. Plenty of stages with entertainers all day long. I love to go there to just to see performers like Broon, Moonie, and the Merry Wives of Windsor among many others. It's easy to spend a full 8+ hour day at this faire. You pay for parking (I think $10? Maybe $5), and admission is higher than Koroneburg (but referenced the pros above). It feels more commercial. People aren't in your face selling items exactly, but it's just a general vibe. The people working the games are a bit too hard-sell for me. There is some shade but not enough. If it's a hot day, the Irwindale Dam recreation are is not a fun place to be. In the end, each place has perks. I like both, but I'd go to them for different reasons. If I'm all about shopping and food, I'll go to the SoCal faire. They also have some high quality entertainment. If I want an experience that feels less commercial, I'll go to Koroneburg. What are some of the things you like best about your local faire? We go to the Minnesota Renaissance Festival, one of the largest faires in all of the U.S. I'd have to say the best part is the themes; depending on which weekend you go, you can see performances related to romance, the Celts, pets, ale, etc. The usual performers and vendors are there every time, but at least year after year you can choose to go to your favorite themed weekend or try something new. I worked the California faire circuit for...15 years?...untill I moved out of state. Sampled every single one and even made a living being a worker to pay my way to the next. Faire is a calling and a lifestyle if you let it. Could be a mere diversion if you're more sane!! 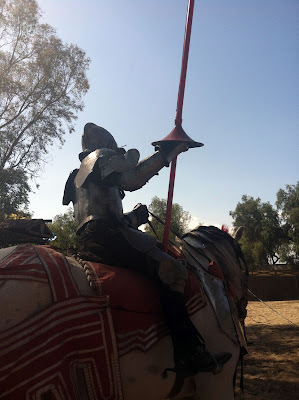 I've sort of wandered what the renfaire lifestyle was like. The Colorado Renaissance Faire is completely built-in. There are little gardens around the booths/shops built to look like cottages and inns. It's a beautiful faire, but not as many people dress in garb as the So Cal Ren Faire. We dressed up and even made a little tunic for our 6-week-old son. It was his first outing. He was adorable and tiny. What the lifestyle is like? Dirty. Drunken. Very hard work too. I'd equate it to very nearly a Carney troupe. You're traveling from locale to locale, setting up, selling to the customer, tearing down, etc. It's a hectic work day that allows you to play hard as well. Thanks for giving info on the Koroneburg Festival! I've wanted to try it but wasn't sure if it was going to be disappointing compared to the big So Cal Pleasure Faire. My favorite part about going is dressing up. This year I added a belt, circlet and elf ears to my ensemble. I like when faires are permanent structures and have places for the vendors to sleep at least. What is that amy tell me bandar togel ? ?